Advent is quickly approaching and Christmas will be here soon... I just realized that quite a few of the links were no longer working on our Catholic Aprons page. I spent some time today updating all the Shopping Cart/Paypal codes and even added a LOVEly new design! Be sure to click over and take a look. 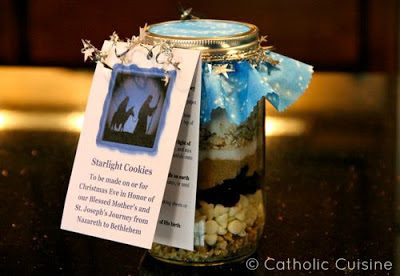 The "Venite Adoremus" Apron pictured above would make a great Christmas gift paired with the Starlight Cookies Jar Mix! 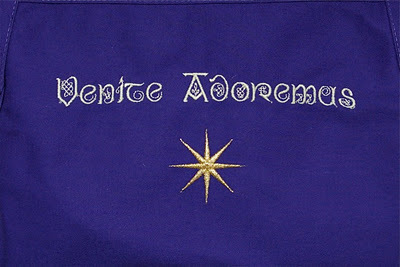 (I just ordered my Advent Apron!) Or you could even put together a gift basket with your favorite apron, a Catholic themed cookbook (such as Cooking with the Saints, A Continual Feast, or Grace Before Meals - Personally I have my eyes on The Saint Joseph's Day Table Cookbook! ), some fun and religious candy molds or cookie cutters, and line the basket with a gorgeous "Silent Night" lace Placemat/Doily, Table Runner (also available here), or Table Topper. There are so many options to create lovely Catholic gifts for all the "Catholic Cuisine" lovers in your life! great idea! They are a perfect gift for my fellow Sunday school teachers, co-workers, and friends!! Thanks for sharing! I am looking at purchasing between 1 and 4 of your aprons. I am in Australia, so I am sure that the automatic postage that comes up will not cover your costs. Can you please email me so that I can arrange the correct payment for you? I just responded to your email through Facebook. Thank you for your interest in the aprons!